From early childhood, Sri Sandhu Om was inclined toward spiritual interests, showing great reverence towards saints and sages. At the age of fourteen, he was already an inspired Tamil poet. 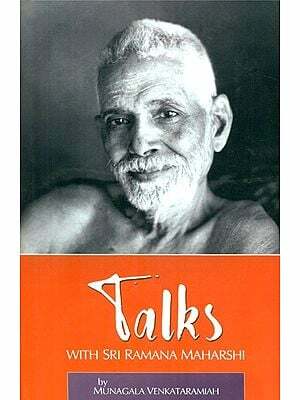 His meeting and direct association with Bhagavan Sri Ramana Maharshi, which lasted only five years due to the latter’s death, not only brought his natural poetical to its full fruition, but also culminated in his enlightenment. Sri Bhagavan often said, “As coal takes time to ignite, and charcoal is proportionately quicker, gun powder ignites immediately.” This latter example proved to be true in the case of Swami Sadhu Om, whose enlightenment came about from being with Sri Bhagavan for only this comparatively short period. The deep spiritual insight shown in this book clearly proves that Swami Sadhu Om does not fail into the category of ordinary seekers, but had reached the end of the spiritual quest. When dealing with questions on spiritual matters, Swami’s replies showed that it was only through the grace of his guru that he was able to do full justice to the many subtle points brought up. His answers to spiritual questions, addressing the various standpoints of the different listeners, were always revealed with refreshing and joyful originality. The Swami’s whole-hearted devotion to his guru, and one-pointed adherence to his teaching, make him a fit channel for Sri Bhagavan’s grace. It continues to flow, and can fill the listener or reader with the near same richness of Sri Bhagavan’s grace. Sri Sadhu Om Swami came to Bhagavan Sri Ramana Maharshi from the district of Thanjavur in the South India state of Tamil Nadu. This region is famous as a center of Tamil learning and culture. From his early childhood, his life was inclined primarily toward spiritual interests, showing great reverence towards saints and sages. Even in later years, he filled his students and listeners with stories about their lives. In his early teens, he was by grace already an inspired Tamil poet, which inspiration came to him at the young age of fourteen. 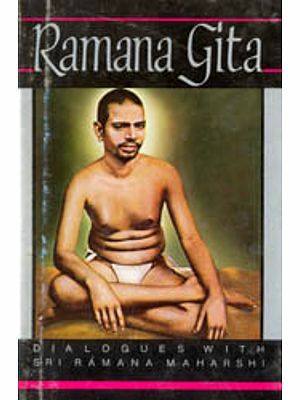 His meeting and association with Sri Bhagavan Ramana brought his natural poetical aptitude to its full fruition, and up till the time of his death in March 1985, he composed around six thousand songs and verses, singing his devotion to his Guru Ramana, by depicting the unique glory and the beauty of His life, or expounding His philosophy in the most undiluted form in a language that was a marvel of simplicity and clarity, and that cannot fail to move one's heart and make us want to know more about Sri Bhagavan Ramana, and about His instructions (upadesa). 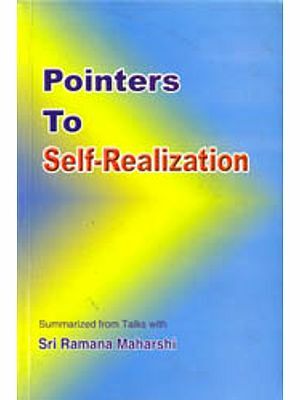 When answering questions on spiritual matters, Swami's replies showed that it was only through the grace of his guru, Ramana, that he was able to do full justice to all the many subtle points brought up; and to reveal the answers that addressed all the various standpoint's of the different listeners, which was accomplished with a refreshing and joyful originality. His association with Sri Bhagavan lasted only five years due to his master's death. As Sri Bhagavan says, "For men under the powerful glance of the Guru, as coal takes time to ignite, and charcoal is proportionately quicker, gun powder ignites immediately." The latter example proved to be true in the case of Swami Sadhu Om, whose enlightenment came about from being with his master for only this comparatively short period. 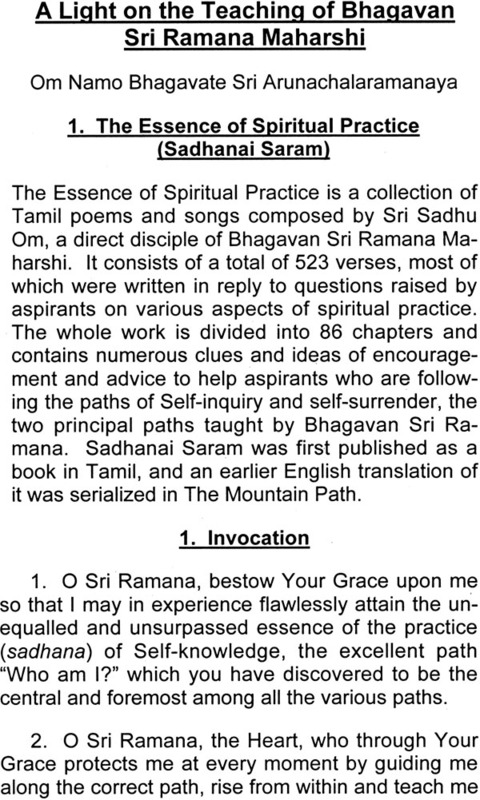 Although his was a relatively brief association with Sri Bhagavan Ramana, through his longstanding association with Sri Muruganar - himself a greatTamil poet who became instantly enlightened by the presence and grace of Sri Bhagavan - Swami Sadhu Om was able to absorb the import of Sri Bhagavan's words of wisdom in the terse classical Tamil language in which He spoke and shared his teachings. Moreover, the Swami's whole-hearted devotion to his guru, and his one-pointed adherence to His teachings, make him a fit channel for Sri Bhagavan's grace to both flow and fill him with its rich abundance. And it also causes the listener or reader to be filled with the near same richness of Sri Bhagavan's grace. This means Swami Sadhu Om had the three essential qualifications to explain the teaching of Bhagavan Sri Ramana Maharshi to those who came to him looking for clarification. Although he professes to not have a high command over English, his native language being Tamil, with the help of the three essential qualifications - i.e., having lived in close proximity to Sri Bhagavan Himself, having also a clear understanding of even the classical Tamil language used by Sri Bhagavan, and having himself realized and directly experienced the Wisdom and Truth as shared by Sri Bhagavan - he was well able to detect the faulty understanding of those who, per force, must depend only on the English versions in their approach to the teachings of Sri Bhagavan Ramana. Some people tend to gauge the real worth of each devotee of Sri Bhagavan by the number of years they lived with Him, since having a long relationship in close proximity with the Guru is usually a major criterion for being qualified to teach or advise others in the proper use of His teaching; although the time a disciple has spent in the physical presence of his Sadguru is not a criterion by which one can judge his spiritual attainment. When one such person once asked Sri Sadhu Om Swami in a slightly disparaging manner, "You lived with Sri Ramana for only five years; are there not many who lived with Him for many more years than you did?" he replied, "Yes, I am indeed ashamed about it, because when even five seconds were more than sufficient for the divine Power shining in the Presence of Sri Bhagavan to quench the spiritual thirst of mature souls, if five years were necessary in my case, does it not show my state of immaturity?". This reply was typical of the unassuming and self- effacing attitude of Sri Sadhu Om Swami. In spite of his versatile genius as a Tamil poet of surpassing excellence, a talented musician, a melodious and sweet-voiced singer, a lucid writer of prose, and a brilliant philosopher endowed with a deep spiritual insight and a power of expressing the truth in a clear, simple and original manner, he never sought for himself any recognition or appreciation from the world. In fact, his life was a perfect example of strict adherence to the principal precept taught by Sri Bhagavan, namely that we should deny ourself at every moment of life by giving no importance to our own individual entity, and should thus completely erase our ego. Though some of Sri Sadhu Om Swami's writings in both prose and poetry were published during his lifetime, and though many more have been published in Tamil after he shed his physical body in March 1985, his attitude towards the publication of his writings was quite different from the attitude of many other writers of spiritual or philosophical books, who of their own accord seek to share their knowledge with the world by writing and publishing books. "We should not open the door unless it is knocked" was the principle underlying all his acts. Unless he was questioned with sincere earnestness, he would not speak or write anything about spiritual matters. Sri Sadhu Om often used to say, "We should not run after the world; we should not look outwards at the world, we should look inwards at Self. Those sannyasis (spiritual seekers) that run after the world achieve neither the world nor Self (God). If we try to chase after our shadow, we will never catch it; but if we go towards the sun, our shadow will automatically come running behind us. Those sannyasis that are always attending to the world with the aim of teaching the world became spoilt in the end...''. An invitation once came to Sri Sadhu Om from an earnest seeker in U.S.A., "Will you not come to the West and guide us?" His attitude is shown clearly in his reply, which ran as follows: "It is unnecessary for the Reality to run after the world. 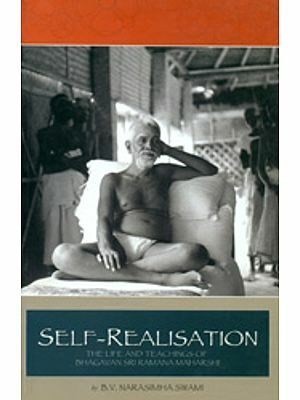 Moreover, according to the great truth discovered and revealed by Sri Ramana Bhagavan, a good person leading a simple yet highly spiritual life, and passing away unknown to the world, does far greater good to the world than all the political and social reformers and all the platform-heroes of philosophy. A truly enlightened life will surely help earnest seekers even though they may be living in a remote comer of the world and even without any physical contact, communications, magazines or writings. This is Sri Ramana Bhagavan's method of teaching the world through speech-transcending Mystic Silence, the greatest Power. Is it not up to us to follow the footsteps of our Guru, Sri Ramana? So, why should I think of going anywhere? As He who has guided me to His home is the Father, Lord, and in most Self of one and all, does He not know best how to guide home earnest seekers, wherever they may be? Why then should an ego rise with the thought "I should guide people?" If such an 'I' were to rise, would it not be a self- conceited attempt to belittle the Grace of Sri Ra-mana, the one reality? Therefore, the thought of going to the West or the East, or here, there or anywhere else, has never occurred to me and will never occur to me!" Thus, Sri Sadhu Om stood as an example of how those who wish to follow Sri Bhagavan should conduct their lives. Because of his self-effacing attitude, he was always indifferent to the publication of his writings either in Tamil or in English. When he answered the questions of those who came to him asking him how to practice the path of Self-Inquiry, he never expected that his replies would one day become a book. At no time did he ever have the least intention that he should write a book. When aspirants asked him questions about spiritual matters, he would sometimes reply, "Since you ask me, I can answer, but only in accordance with the teachings of Sri Bhagavan. Do not expect me to give replies in such a manner as merely to please you. I can tell you only what I have come to know from Sri Bhagavan. If you ask about paths other than Sri Bhagavan's path of Self-Inquiry, I can also explain about them, but only in the light of Sri Bhagavan's teachings. His teachings alone are the authoritative sastras (scriptures) for me. If the world chooses not to accept my ideas, it does not matter; let it throw them away." Sri Sadhu Om was never concerned in the least about what others thought of his views, nor about whether or not his ideas would be valued by the world. Regarding the books that were published in his name, he once said, "I told whatever I know only for those who asked me. I do not object if they wish to share these ideas with others by printing them in the form of books. But I have not come to the world for writing books. I am not a writer, nor do I have any desire to become a writer. If the world likes to have these ideas, then it is its own responsibility to publish them." 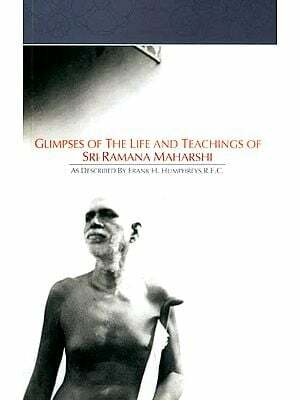 Therefore, this book is published only for those who appreciate Sri Sadhu Om's unswerving adherence to the clear and direct path brought to the world by Sri Bhagavan Ramana.